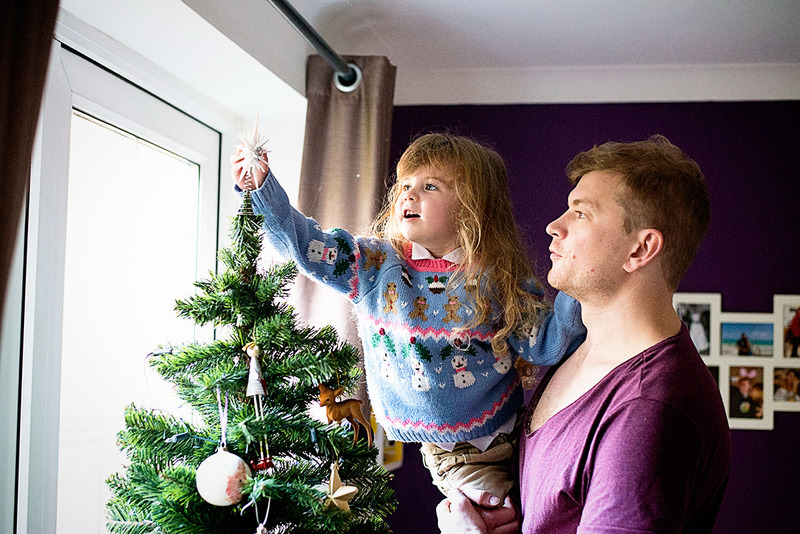 Every year we like to have what we call ‘our festive day.’ Put simply this just means we prepare our house ready for Christmas and we start to get excited about the big day. 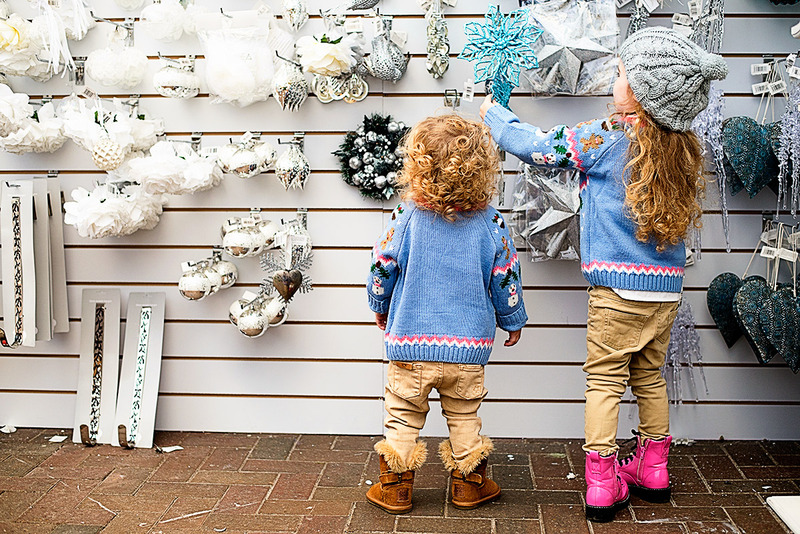 The day starts off at our local garden centre, which is always really Christmassy, and the girls choose a new decoration for the tree. This is my favourite part of the day as I like to think when they are ready to move out many years from now, they will take with then a whole host of memories and sentimental value attached to these inevitably tacky ornaments. After the serious decision of choosing a decoration, we stop in the garden centre for lunch. We go there a fair bit, in fact most weeks, but somehow when Daddy is with us it feels a lot more special. There of course is always cake, before we head home excited and fuelled to put up the tree. Tacky Christmas music will always be put on, along with the heating to make it cosy and warm inside. I will always light a candle or two as well. 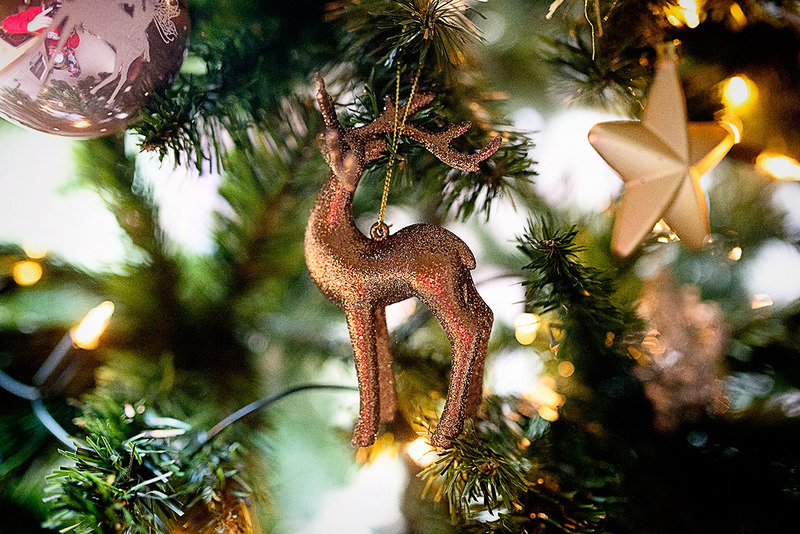 We then get down to the matter in hand, a bauble always gets trodden on and broken, and we remind ourselves each year about which decoration we had the year before that. This year we were a little worried about the tree, as Walter and Jesse our new kittens are quite partial to a hanging trinket or two, but so far all is well and the Christmas tree has survived. 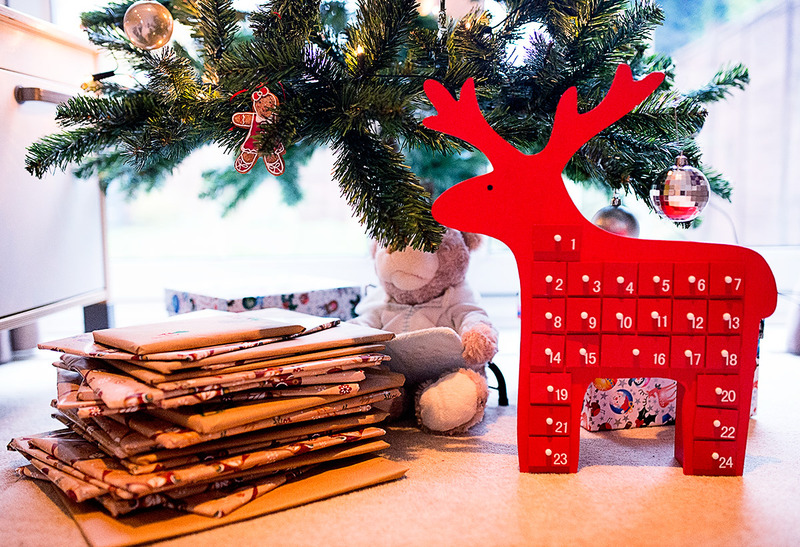 Each year I pack the girls a festive box- inside this year there was a new pair of Christmas PJ’s, a book each (from last year), a reindeer biscuit, and of course Father Christmas and Fairy, our knitted toys who make an appearance every year. The excited look on their faces as they open these boxes really does bring home just how exciting Christmas is when you are little. It certainly is true that it is oh so magical when you watch it through a child’s eyes. Then it’s time for a little nap, before all snuggling on the sofa to watch a Christmas film. This year it was Mickey’s Christmas. Snuggling up on the sofa, in darkness except for the twinkling fairy lights shining on the tree, there is literally no where else I would rather be. December is my favourite month of the year- not least for all the festivities, but for the fact that it is our wedding anniversary on the 20th and of course Mads birthday on Christmas Eve. We welcome it excitedly and there is nothing better than to celebrate it’s arrival than with our annual festive day. 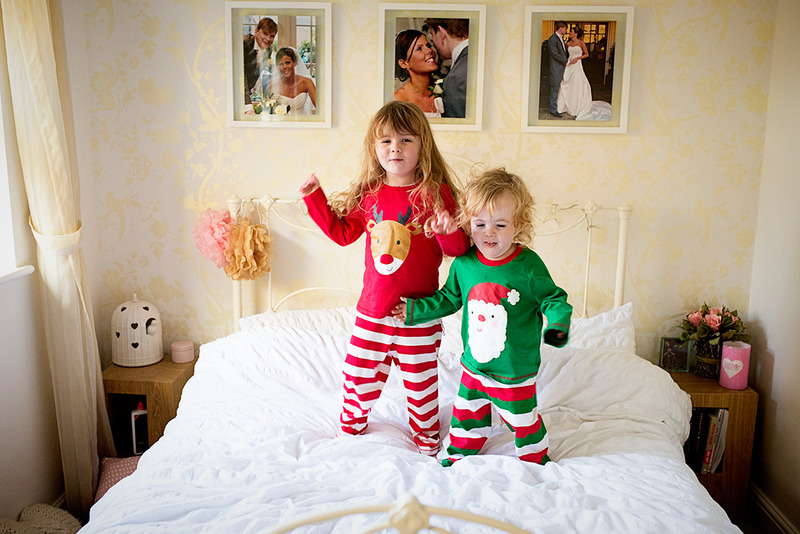 I had to dress them in their matching Christmas Next jumpers I bought them a few weeks ago- they are so cute. They had a great time picking out their decorations at the garden centre. Mads decoration for this year- a little felt deer. LL’s is a slightly more blinged up, glitzy deer. The piece de resistance- putting the star on top of the tree. I remember so fondly doing this with my Dad each year so it makes me feel sentimental watching Mads do it with her Daddy. 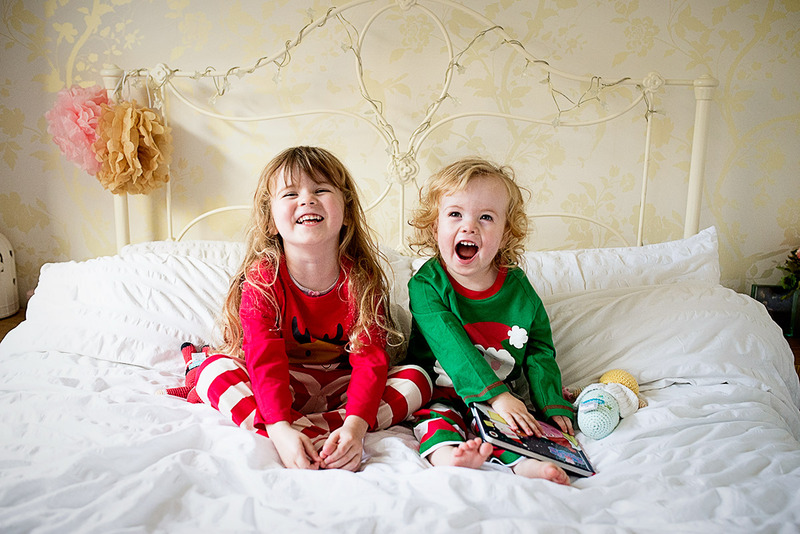 They got new matching Christmas PJ’s in their boxes this year- Mads has a reindeer on hers and LL has Father Christmas. I love this photo of my happy ladies. A spot of bed jumping before nap time. 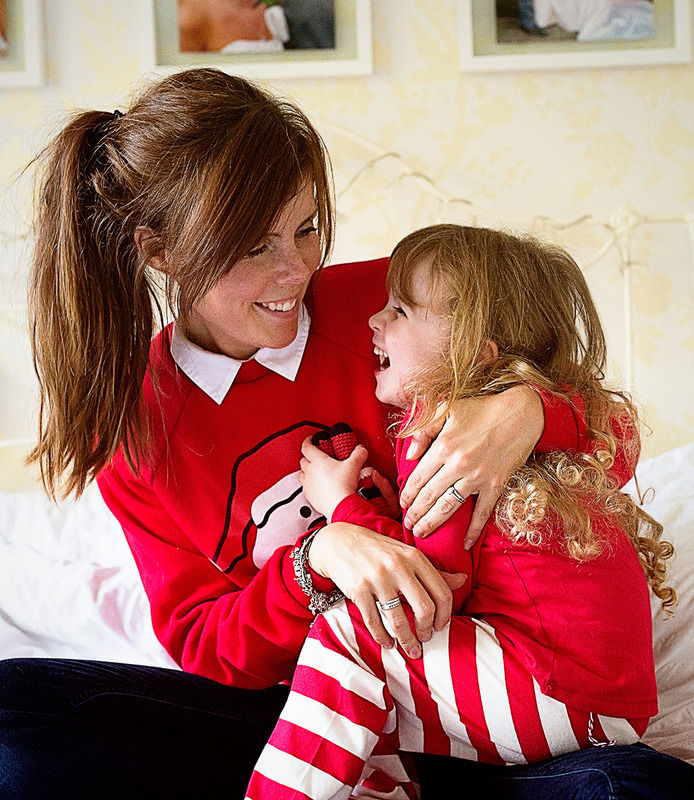 Mr E rarely takes photos but he managed to capture this one of myself and my big girl- I love it so much. 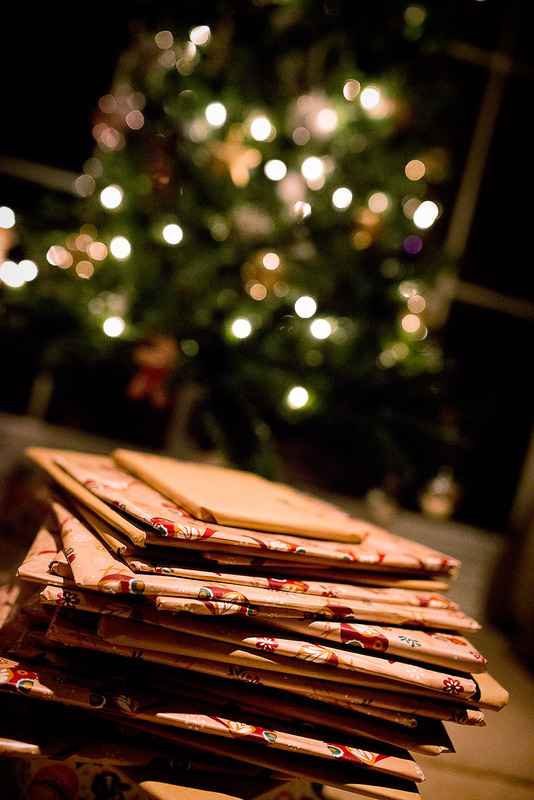 We spent ages wrapping up their books ahead of the 1st December. This year we are doing a book advent, I rewrapped some of last years books, bought a lot from charity shops and also bought a few special new ones too. 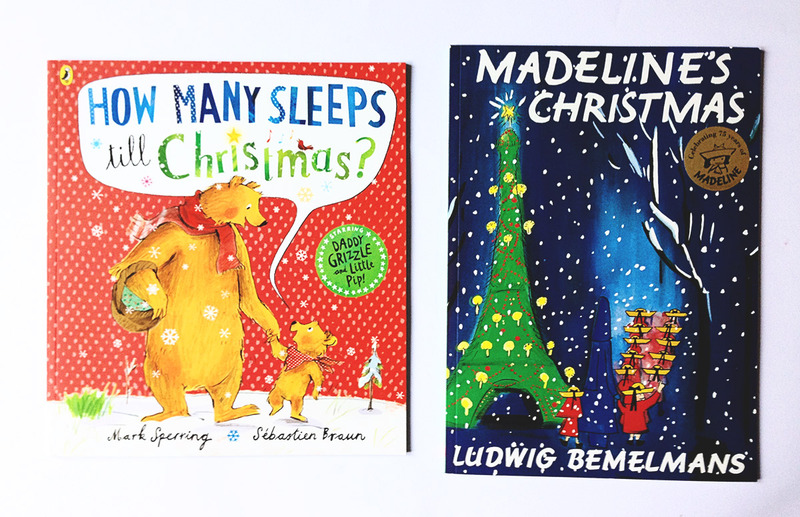 A couple appropriately named books that we wrapped up, the Madeline’s Christmas is for my Mads to open on her birthday on Christmas Eve. I have been collecting them for months and can’t wait to see their faces each evening as they open them. 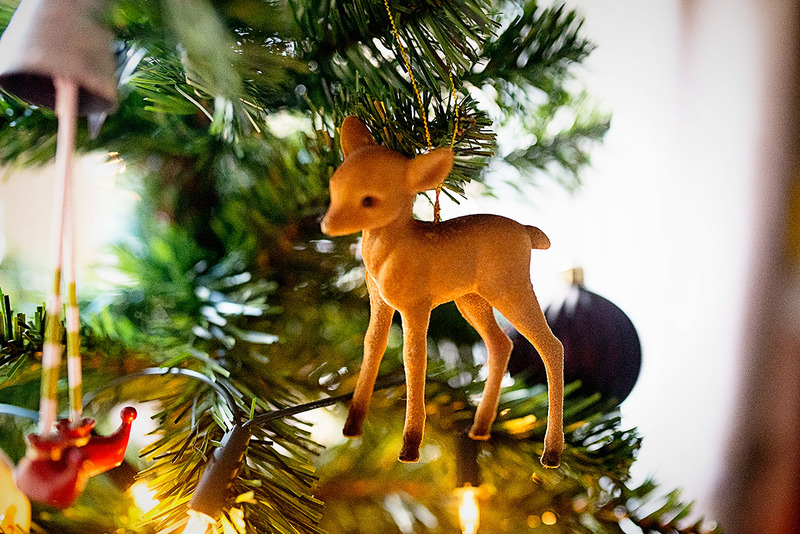 We also have this little reindeer who is looking after some little surprises- sweets, little tiny prizes like keyrings, minature figures etc. This is such a lovely post! I loved the video and their faces when they opened their boxes, children bring alive the magic of Christmas. Let me tell you a little story. This morning I got in my car, a Christmas song was on the radio. Despite having our Christmas decorations up I didn’t feel at all Christmassy, probably because none of our neighbours are at all festive just yet. Anyway, I came home, checked Bloglovin and saw this post. I then opened Youtube and watched the video and guess what? I NOW FEEL CHRISTMASSY AGAIN!! Thank you. Ll’s face when she pulls the book out of her Christmas box is so adorable. And Mads has the cutest smile. Oh how lovely is this post. They look adorable in their little Christmas PJs. We haven’t put our decorations up yet, but I can’t wait! Beautiful pictures. I have a bare tree at the moment as I am waiting for my lights to be delivered! Really want to dress it. Well this is my first visit to your blog and I am so impressed. The video you made totally captured the feeling and love of Christmas and I had that gasping hold back tears moment when the little ones got their boxes. (yes i’m the mum who cries at the nursery nativity) Thank You for sharing a wonderful, happy post. It looks like a lovely day, I am planning on taking mine to the garden centre soon as we love how they decorate it! Oh that’s so sweet – I love that Mads is hiding with the kittens! 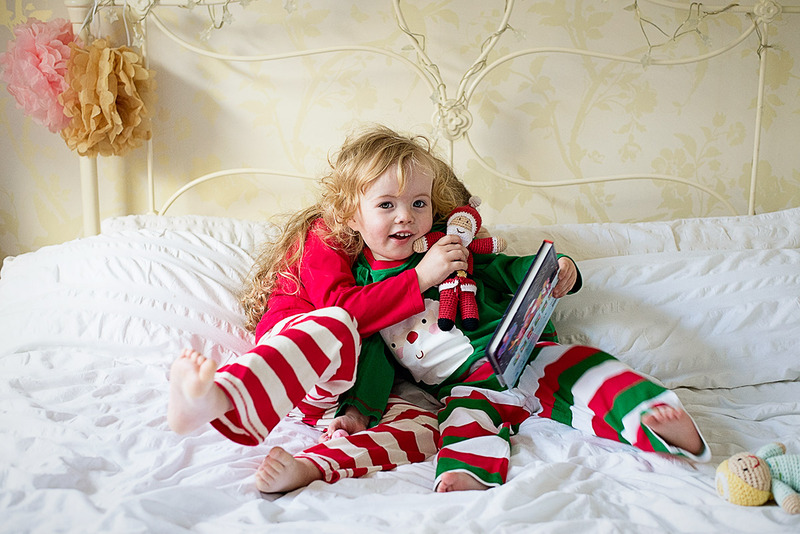 It looks like you’ve really kicked off the festive season in style – Christmas jumpers and all! Oh Katie it really is beginning to look a lot like Christmas. So adorable. This post just made me want to dance around to Christmas music and sip hot chocolate. Lovely. Oh my goodness!!! How cute are you guys!? I LOVE this post so much. You write so beautifully about your family and your pictures are perfection! 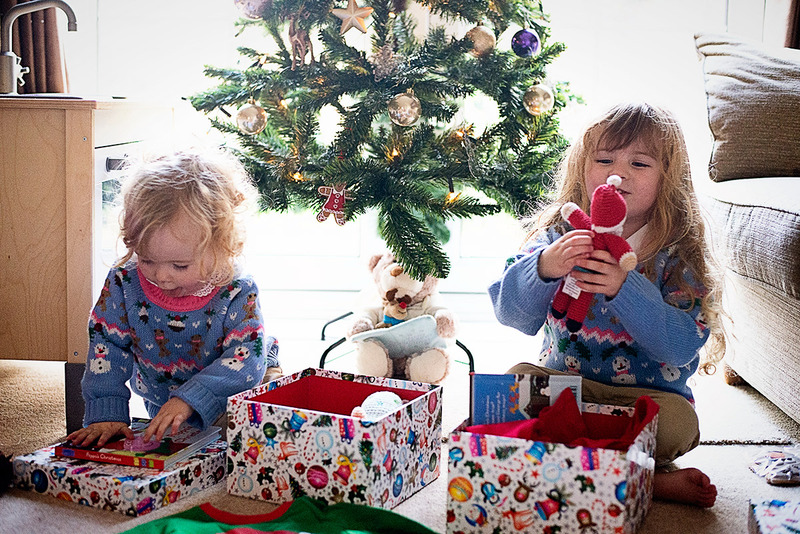 I do Lili and Poppy’s Christmas boxes on Christmas Eve with their pyjamas, Christmas Day dresses, a book and toy. Noticed the IKEA toy kitchen in the background, we have that too and the bath toys – which made me smile.